Baltic region. New challenges, old adversaries. How to prevent future threats to the Baltic region was the main topic at the Estonian – Lithuanian summit, held in Tartu. The two states seek to become NATO’s energy and cyber security hubs not forgetting a recent period of tension with Russia. Estonian President Toomas Hendrik Ilves assured the support of his country in developing the energy security centre in Lithuania into a NATO Centre of Excellence, as the alliance’s cyber defence centre in Tallinn. His Lithuanian colleague Dalia Grybauskaite highlighted that both countries are united by the common goal of preventing the use of energy as a political tool. It is therefore necessary to speed up the integration of the Baltic States’ electricity market into the Nordic market (NordPool), to diversify energy supplies and to reduce dependence on a single supplier. Mrs. Grybauskaite said that his country supported the construction of a LNG terminal in Estonia or in Latvia, but it had decided to build its own terminal in Klaipeda. She pointed out that several terminals operating in the Baltic countries would increase competition in the gas market, ensure lower consumer prices and strengthen the region’s energy independence. Speaking about cyber security, Mrs. Grybauskaite proposed to follow the recommendations of the former foreign minister of Norway, Jens Stoltenberg, and to form a Nordic-Baltic cyber defence force. 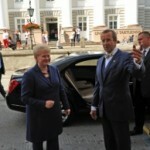 Presidents Ilves and Grybauskaite discussed the neighbourhood policies of the European Union, with an emphasis on Ukraine, Georgia, Moldova and Belarus. “The government in Minsk, which talks to its people in the language of batons and imprisonment, is not fit to be a part of today’s Europe. In this case, the European Union should use powerful words to provide balance, by uniting its voice with its mind; the pressure on the Belarusian regime needs to be powerful and efficient, with all sanctions very accurately aimed,” President Ilves added. Travel to the Baltic Hansa, book by Giuseppe D’Amato.